This promised to be the greatest challenge of our trip so far. 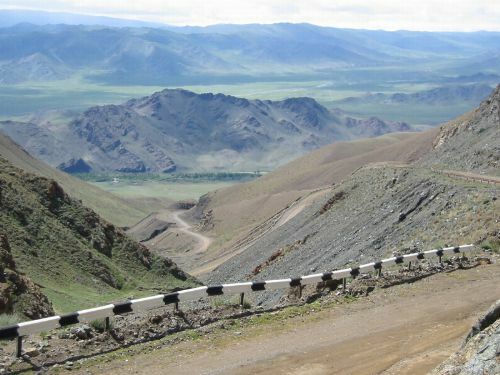 An off road connection between Altai and Tuva via 360km of tracks including a 2500m pass. We calculated that it could take as long as fifteen days and took 48 packets of noodles, 25 onions, 9 loaves of bread, 3 big dried sausages, 2.5kg of porridge, 3kg of pasta, 15 Snickers bars, 6 packets of biscuits, 140 sweets, 6 deep fried cabbage doughnuts, a 3kg leg of lamb (cost $3 !!) and a kilo of salo (raw pig skin). 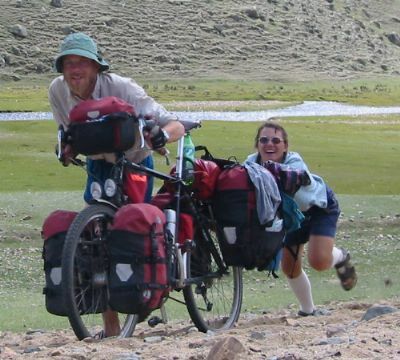 I reckon my bike weighed about 60kg when we left Kosh Agach, and Ju's about 45kg. We had detailed maps of the first part of the route but just a road atlas map to guide us once we were over the first passes. 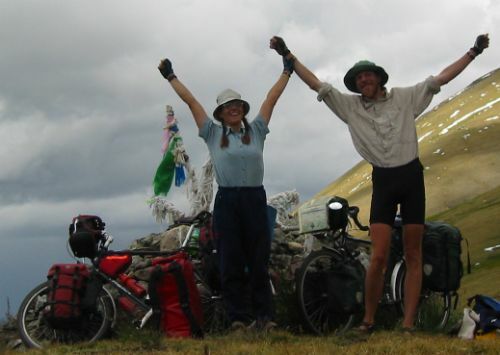 Information on the route was sketchy but we knew that people had done it by four wheel drive and someone we met in Gorno Altaisk emailed us to say they had done it in a four wheel drive minibus. They spent a night stuck in mud, but they did make it! Anyway, we followed the bigger track up the valley, past snow capped peaks. It was very enjoyable cycling, the track was smooth (smoother than any Romanian road), the sun shone and we made good progress. We camped amongst the pine trees, lit a fire, brewed many teas and ate some of the leg of lamb. It took two hours to set up the rope, get everything over (we carried the bikes strapped to our rucsacs) and sit down for long enough to recover from the experience. 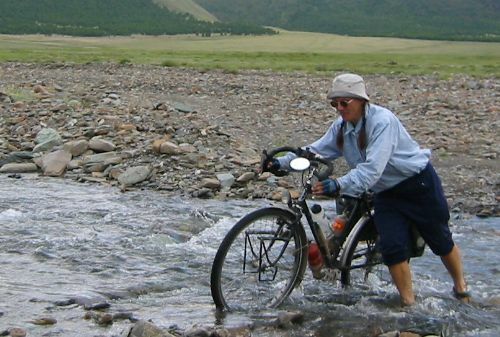 Thankfully although we crossed several smaller rivers that afternoon, all were easily forded. Later that day we stopped opposite the yurt in the photo below. 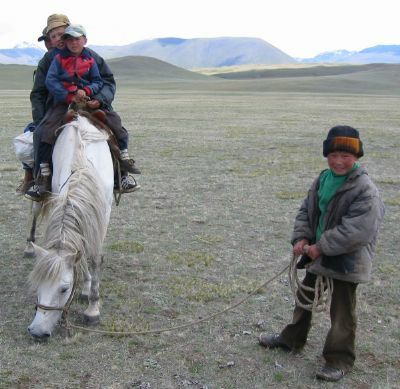 A man and a boy forded the river on their horse (horses are good at crossing rivers) and came over to talk to us. We bought 3 litres of milk and some incredibly hard sour cheese from them, in return for coffee, sausage and fifteen roubles. We have decided that coffee is a good gift because it is light to carry and relatively valuable. 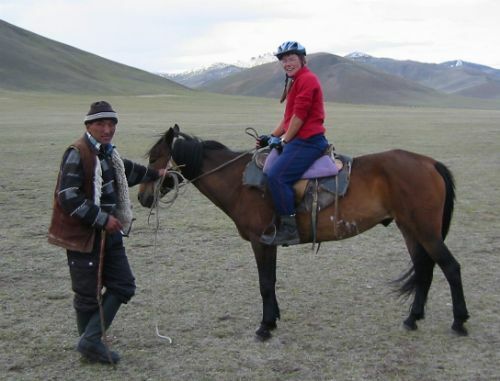 As we were looking for a place to camp we met a herder on horseback. He stopped to chat and let Ju have a go on his horse. We were up early, keen to get over the Buguzun Pass and see what it was like on the other side. We went the wrong way and had to cross and re-cross the river, but it was only knee deep and easily forded. 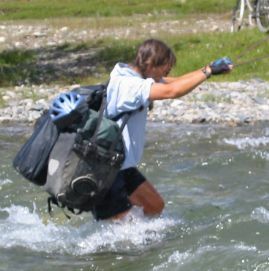 We have found the best way to ford a river is with the front panniers removed as they are low and catch a lot of water. Then we re-cross the river to fetch them afterwards. In one place the track actually went up the stream bed, but again it was not deep. Then we began to climb the pass proper. It was steep enough that we had to push our bikes, but we were at the top (all of 300m above our campsite) in about three hours. As we freewheeled down the other side clouds began to mass and we worried that a thunderstorm was imminent. We decided to camp early while it was still dry, after all we done a pass so we deserved a rest. Once the tent was up a soldier stopped nearby in his 4WD and asked where we were from. I think he may have been expecting to see us, because he was friendly and helpful and didn't ask to see our passports or our permit. 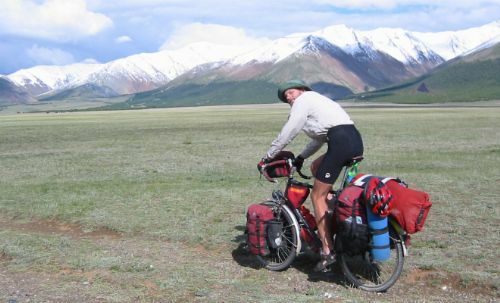 He told us that the Buguzun wasn't really a pass, more like steppe! We were up early again, hoping to get some miles in before any bad weather came our way. 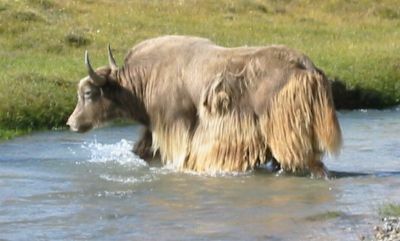 The first excitement of the day was seeing yaks for the first time. They weren't as impressively shaggy as they are in most photos because they had largely moulted for the summer. We met the soldier again as we were standing by a track junction wondering which way to go (our maps didn't really show which tracks were best). He told us to go right, took a photo of us with our bikes, and said a lot of other things we didn't understand. About midday the sky turned black, thunder began rolling around and it rained hard and then hailed. We took shelter under our tent groundsheet protector, fortunately it blew over after a few minutes. Then we continued over a low pass, from the top of which we got a surreal view of dark clouds, grey / white hills (covered in hailstones) and a lake, Ak Khol. Once again it was unclear which way we should go. There also seemed to be a lot of people on a knoll near the lake, shouting a lot and applauding. We thought that maybe they were drunk and best avoided. As we were prevaricating a jeep passed nearby and we flagged it down and asked the way. The driver told us to go to the north of the lake (there was a bridge there) and probably tried to tell us what all the people were doing but we didn't understand. We pedalled on, the track didn't go too near the people so we just gave them a friendly wave and didn't stop. When we got further round the lake we looked back and saw several tents, a yurt, about a dozen buses and lots of people. We then realised that it was some kind of sporting event. Maybe we should have gone back but these things are hard to enjoy while trying to keep one's eye on bicycles and baggage. 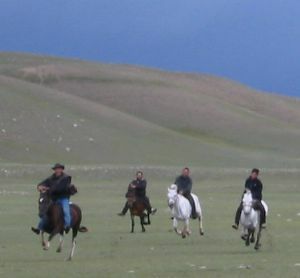 Then the horse race came past, for Ju this was the highlight of the trip, thirty young men racing their horses past us, whooping and cheering. 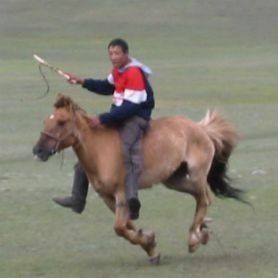 Add a few swords and spears and they could have been the warriors of Ghengis Khan. 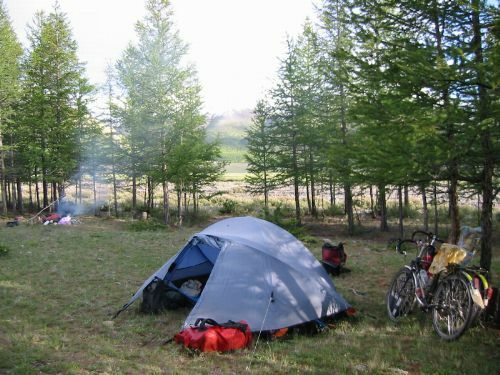 We laboriously climbed a pass to the east of the lake and descended to camp by a river. Our map marked a bridge over the river a few kilometers downstream. 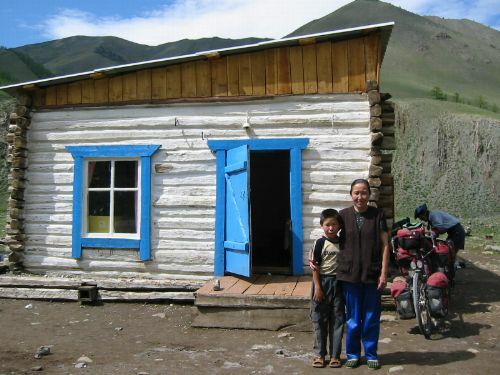 We set off for this, on the way we stopped at a yurt to buy yak milk and cream and asked directions. They said there was a bridge 3km upstream but there was no obvious track to it so we chose to believe the map. Unfortunately the bridge marked on the map had long since collapsed but it wasn't too hard to ford the river. 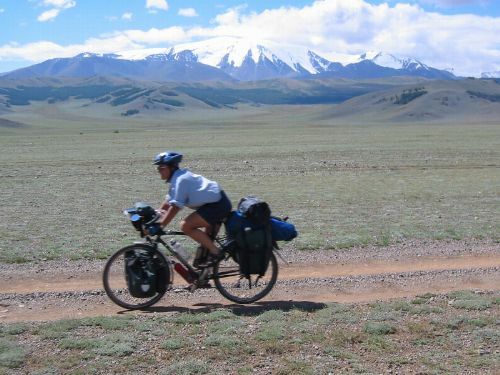 Then we pedalled across the steppe, asking directions from anyone we met. At one point we had to both push each bike in turn up a sandy bank for 20m to get back on the right track. That afternoon we climbed yet another pass (none of the passes were very high above the steppe - typically no more than 200m) and got a view of Lake Khindiktig Khol, about 5km across. That night we camped by the lake just before a thunderstorm rolled in. 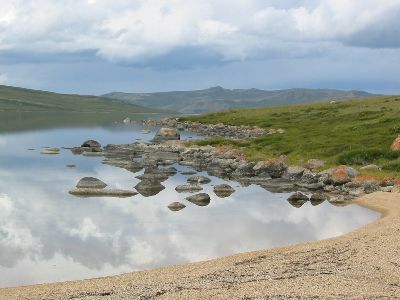 We did a great deal of up and down this day, firstly going around the lake shore where the track climbed over a series of bluffs and dipped down to gravely beaches in-between. In places the track was muddy or boggy, perhaps enough to stop a vehicle if it had been wetter. This was one particularly nice sandy beach where we had a brief dip in the chilly waters and lunch. Then we climbed a series of false summits to finally reach the top of a pass at about 2450m. From there we descended 300m into the Kargu valley and it was downhill all the way to Mugur Axy. The weather had become very windy and a storm threatened so we stopped at the first place we found shelter. We needed a bit of a day off after the hard work of the last six days. Also we wanted to get to Mugur Axy in the morning so we would have time for shopping for the food for the next leg of the journey, and then be able to get a decent distance out of town. There was a strong wind behind us and the track was mostly downhill so we whistled along for the morning and then camped early in the shelter of some trees. The mountain in the background is called Mongoon Taiga. Our visit to Mugur Axy was a bit fraught. About a dozen children attached themselves to us and followed us around, they were friendly but a little trying. A pleasant surprise was that there was no shortage of shops, true to form however few of them had much selection. We couldn't get bread but I did emerge from one with a big smile, carrying two cucumbers, two tins of tomatoes and a big sausage, and in another we got a cabbage! Apart from that it was the usual tins of fish and stale biscuits, at least we won't starve. 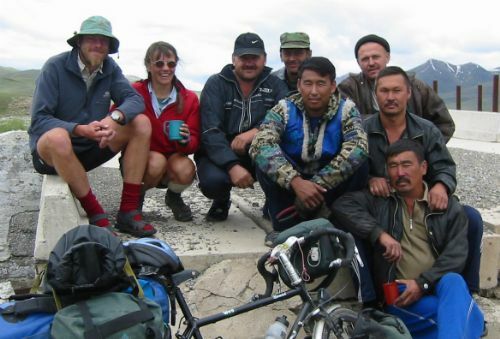 We also found that the route to Ak Douvrak marked on our map did not exist, not only did it disregard a chain of 3000m mountains, the local people all insisted that the only way was via Chadan. The only problem with this was that the direct route would have been about 60km whereas "via Chadan" was about 200km! We started by continuing S.E. 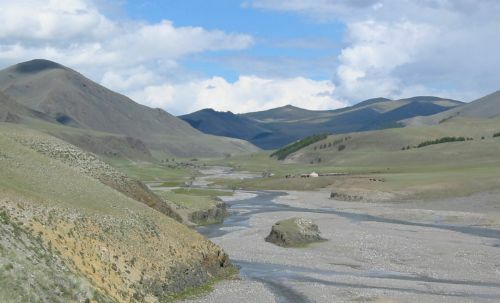 down the Kargu valley in search of the pass that was supposed to lead east to Chadan or Ak Douvrak. Just as were thinking that we must have missed it and would soon be at the Mongolian border, we spied three big Kamaz trucks in the distance. There was no way they could have come down the tiny track we were following so that meant they must have come over the pass. When we reached the pass it was a properly built dirt road, with bridges, crash barriers, even "Cows on road" warning signs! It was also jolly steep, so much so we had to push our bikes up it, for 500m of ascent. From the top we bumped our way down a rocky road with such a strong headwind we had to pedal even though it was downhill. Ju was a bit unwell with a stomache bug yesterday and today so we started late and took things gently. The high point of the day was a cafe - the first in ten days! 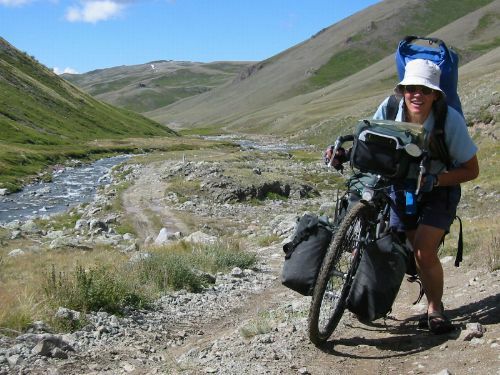 The cafe owner was a very friendly lady who described the direct route to Ak Douvrak which left the Chadan road behind her cafe (passable by horse or jeep only - the river crossings are numerous and too deep for a human to ford. Some Japanese did it one winter walking on the frozen river). We opted for the dirt road to Chadan, and fuelled up with soup, cakes, meat doughnuts and some seriously incredibly hard cheese that she gave us. Spent much of the day bumping downhill from the Arzarti Pass (2200m). About lunchtime we stopped at a stream and I walked to a nearby yurt to try to buy milk. They didn't have any milk but they sold me a litre of smetana (thick sour cream) instead - delicious! When I got back to the bikes I found a that the place had become an impromptu truck stop. A dozen Kamaz lorries were parked up and their drivers were brewing tea and opening tins of meat. They offered us a lift to the asphalt road, which we refused with some reluctance! Ju had been unwell since Mugur Axy, some sort of tummy bug which wouldn't get better, so we called a day off. Next day was cold with a stiff wind and big hills, when a truck driver stopped to tell us that is was going to snow and offer us a lift, we couldn't refuse! He took us about 80km, off the awful stony dirt road and up the pass over to Chadan. The following day we did 54km, almost all of it downhill, into Chadan, where we were put up in the "Technical school" (the hotel was shut for renovation) and Ju visited the pharmacy.